My go-to natural makeup products after a year of testing for those looking to clean up their routine. This is a highly requested wellness post. I get a lot of questions on Instagram Stories about my natural make up routine and skin care. Hopefully this can serve as a super in-depth resource for those of you who are looking for a susinct, no-fuss dive into 'green beauty'. I did the research so you don't have to. Please feel free to take the shortcut. Your body absorbs what you put on your skin. It seemed silly to me to be someone who cares about what they put IN their body with food, but didn't take that same care to what I was putting ON my body. While a lot of sources quote 60-70% absorption of product, I've seen conflicting numbers so I won't state a definite here. So let's go into this knowing some of the product ingredients are going into your body. And the ingredients...they're not good. The US is decades behind cosmetics ingredient regulation. There are over 1000 ingredients banned in the UK while in the US...it's only about 30 ingredients on the banned list. Switching from conventional drugstore or mainstream Sephora makeup was overwhelming for me. I didn't know everything to stay away from. I wanted products that worked as good as or better than conventional. Especially since it's not exactly an inexpensive foray into the natural product world. I'm currently 90% natural in my makeup and skincare routine. There are a handful of specialized products I just haven't found replacements for. And thankfully they're not everyday products so I'm not applying them on the regular. To be specific, I'm still looking for a natural primer, a makeup setting spray and a highlighter that can beat Becca highlighters (I don't even know if that exists). If you're a beginner and don't have the same skin type as me (normal to dry in winter) or are looking for other products, I highly recommend Follain which is basically the Sephora meets Whole Foods of natural makeup. It's a curated website that only allows certain standards of product and ingredients in the shop. It's also not an overwhelming amount of product to look through. If you can, and you happen to live in Boston or DC, I recommend going to the shop and talking with someone who can physically look at your skin and tone and help you pick the perfect thing. That said, Sephora has started carrying some items from natural brands like RMS and ILIA so you might just be in luck. These 'Holy Grail' makeup items are based on what has worked for me. I'm mostly normal skin type but in winter I am dry...so there are lots of cream based vs powder products here. If you're 'greasy', this is probably not a good selection for you. I also want to say these smaller brands don't necessarily have an inclusive shade range. Many of these products are also on the lower coverage side of the spectrum. I, thankfully, have 'good skin'. I don't have a lot of pigmentation or textural issues, so the selections in the face section below are not full coverage. I will also say that compared to conventional products which now boast 24 hour wears (why??? ), natural products are definitely not as long lasting for wear period. So go into this knowing you cannot wear this make up from 7 AM to 9 PM and have it look flawless without touchup. Expectations people. I love this foundation and I think you will too if you err on the dry to normal side, and have what you would consider 'good skin' that needs only minor coloration evening out. Reapply every two hours during sun exposure for the SPF benefit. A higher coverage foundation that's also perfect to keep in your handbag (stick foundation). The shade 'fair golden' is perfect for me in spring and fall. It has caffeine for de-puffing and in general is a very hydrating concealer. I'm the color 'light'. I have also heard amazing things about the RMS concealer but haven't personally tried it yet. A stick bronzer that's creamy. It has a definite scent to it that I've grown to really like but at first seemed strong. I will also say this bronzer does have some light shimmer flecks. So if you love a matte finish, this is not for you. I will also use this as a quick eyelid color if I'm traveling. I'm so thrilled with this as a day to day mascara. It separates and evenly coats lashes. There's nothing clumpy about this. If you are just now switching to natural make up THIS is the mascara for you. It's intense and can easily stack up against high impact mascaras at the drugstore. BUT, you need to buy both the lash extender conditioner AND mascara in my experience. Since I have green eyes, I LOVE the shade merlot. Yes, it's purple. No, it doesn't really look like it on. It just accentuates the green. I have found this is a bit slippy and for more staying power sometimes needs a powder to lock it into place. I know some people love their eyeshadow pallets. They overwhelm me. 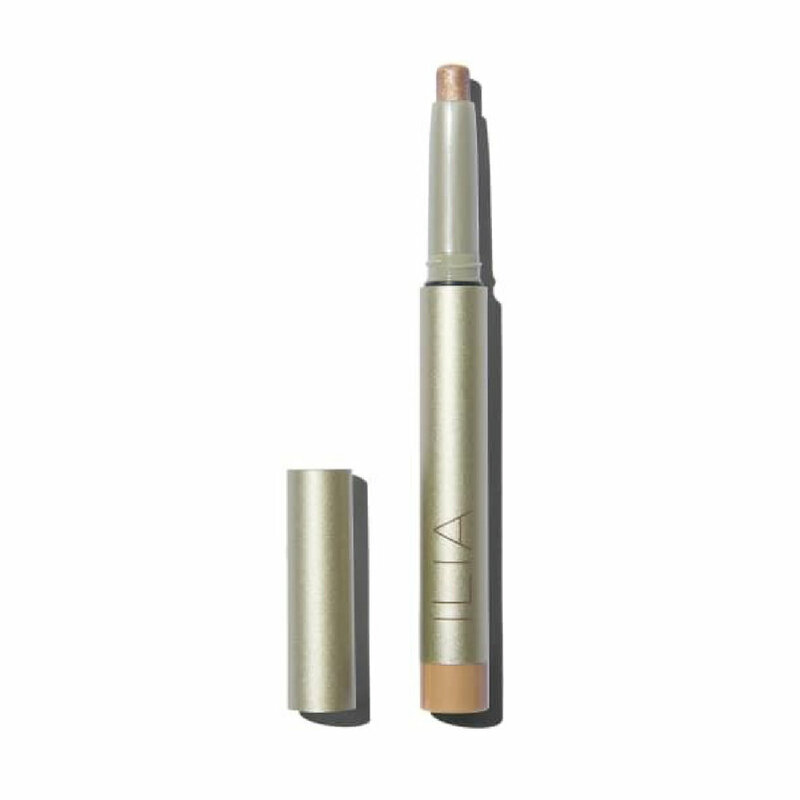 For a single sweep of color, the ILIA shadow stick in 'next to you' is nice, BUT if you're looking for multiple shades and powder, check out RMS which is buildable for more intense color. This colored brow gel is easy to sweep on and use a clean spooly to brush through. I use the color 'blonde' as a medium brunette. This sheer but tinted option is my go-to in the cooler months. It also has SPF included. I have yet to find a perfect shade or more intense coverage lipstick. If you have favorite natural products, please leave a comment or send me an email. I'm always looking to expand my knowledge of products in this space, but as of right now and a little over a year of trial and error, these are my holy grail natural make up routine products.